FILE - U.S. President Donald Trump and Russia's President Vladimir Putin talk during the family photo session at the APEC Summit in Danang, Vietnam, Nov. 11, 2017. U.S. officials are seeking to assure an anxious Western bloc that President Donald Trump will reinforce American resolve to confront Moscow during the upcoming North Atlantic Treaty Organization (NATO) summit and his meeting with Russian President Vladimir Putin. NATO summit leaders will agree to strengthen deterrence and defensive capabilities to specifically address Russia’s efforts to “divide our democratic nations” and its violations of the Intermediate-Range Nuclear Forces (INF) treaty, U.S. 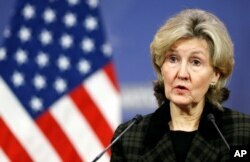 Permanent Representative to NATO Kay Bailey Hutchison told White House reporters on a conference call Thursday. The remarks come amid concern about Trump’s commitment to the alliance, which has been the bedrock of the U.S.-led post-World War II liberal world order since it was signed in 1949. Recently, Trump sent sharply worded letters to leaders of several NATO allies, including Belgium, Canada, Germany and Norway, warning of U.S. impatience with their failure to meet defense spending goals. Hutchison is downplaying the president’s admonitions. One item not under consideration, Hutchison emphasized, is reducing the 32,000-strong American force stationed in Germany. FILE - U.S. Ambassador to NATO Kay Bailey Hutchison briefs the media ahead of a NATO defense ministers meeting at the alliance headquarters in Brussels, Belgium, Feb. 13, 2018. “I’ve heard nothing on that score,” said Hutchison, although U.S. officials have confirmed the Defense Department is evaluating the cost of repositioning U.S. forces in Germany, an action they describe as routine and not ordered by the president. Trump, on several occasions, has strongly questioned the U.S. role in NATO. Combined with the recent tensions between Trump and other leaders of the Group of Seven nations during their summit in Canada, a rift with NATO leaders next week is anticipated by some who worry that would benefit Putin, who is set to meet with Trump in Helsinki on July 16. Huntsman, speaking with reporters along with Hutchison on the conference call, added that the Helsinki summit itself is “a deliverable.” He also said a “concrete agreement” on a key issue, which he did not specify, could result. The whole category of Russian arms control violations “will be prominent on the agenda” and “we’re holding them responsible for that,” Huntsman said. FILE - U.S. Ambassador to Russia Jon Huntsman looks on during a news conference held by U.S. national security adviser John Bolton in Moscow, June 27, 2018. 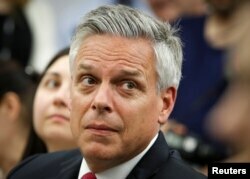 It also is possible, Huntsman said, the two leaders will discuss a new treaty on control of strategic offensive weapons. The current such agreement, known as the New START (Strategic Arms Reduction Treaty), is expected to last until 2021. The one-on-one sit-down meeting between Trump and Putin will immediately be followed by an extended discussion involving their respective senior officials and then a working lunch, according to U.S. officials. There will be significant scrutiny of Trump’s rhetoric during the talks concerning Russian meddling in the 2016 U.S. presidential election. The major intelligence agencies of the United States have clearly stated Moscow interfered in the election, seeking to benefit Trump and undermine his opponent, former Secretary of State and Democratic Party nominee Hillary Clinton. Huntsman insisted Thursday that Trump will address the matter with Putin on July 16. “The ball is in Russia’s court and the administration will continue to hold Russia accountable for its malign activities,” the ambassador told reporters. At the Montana rally, the president said it is important to get along with countries such as Russia and China, and he predicted a smooth encounter with Putin. After the NATO summit and before his talks with Putin, Trump is to visit England and Scotland. He is expected to meet separately with British Prime Minister Theresa May and Queen Elizabeth II. The U.S. president is expected, at each stage of his visit to the United Kingdom, to be greeted by large-scale organized protests. Will Trump-Putin Summit Be Chemistry Vs Substance?